VMware Workstation's Virtual Network Editor can be intimidating and difficult to master, but it's an important tool for creating and managing virtual networks. Many virtualization administrators find in VMware Workstation's networking configuration and its Virtual Network Editor intimidating and difficult to master. But given the flexibility you can gain from creating and managing virtual networks, the Virtual Network Editor is a valuable tool that you should include in your management arsenal. In this tip, we'll outline the core function and capabilities of the Virtual Network Editor as well as five of the most important aspects. 1. Bridged/VMnet0. The first kind of network connects virtual machine (VM) guests to the host's network adapter as if the two are connected to a hub. Both the host and guest have different MAC addresses and different IP addresses. This is the most common virtual network choice and the virtual network that I choose 99% of the time. 2. Host-only/VMnet1. The second kind of network connects the VM guest and the host computer into a private network. 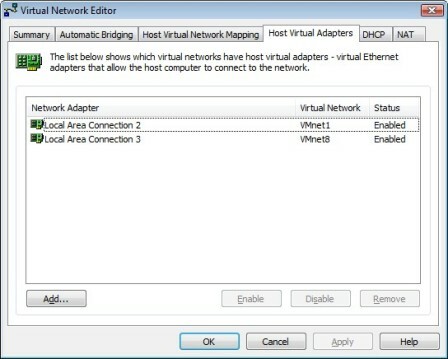 With the host-only network, the guest and host are connected by a virtual adapter on the host and the virtual network interface card on the guest. The guest cannot get to the LAN or Internet to which the host computer is connected. Because there is no LAN access with this method, VMware virtual networking offers a Dynamic Host Configuration Protocol (DHCP) server, enabled by default, which provides IP networking on this network. The DHCP range for the host-only virtual network is 192.168.234.0-254, where the host virtual adapter is 192.168.234.1 and all guest VMs using the host-only network pull IP addresses from the VMware DHCP server. 3. NAT/VMnet8.The third network type connects VM guests to a LAN but using a private IP network between the VM guest and the host computer. Similar to the host-only network, when using the NAT network, VMware Workstation provides a DHCP Server in this virtual private NAT network (as it is needed unless you assign static IP addresses or you create your own DHCP server in the virtual NAT network). The DHCP range for the NAT virtual network is 192.168.220.0-254 with the host virtual adaptor being 192.168.220.1 and all guest VMs using the NAT network pulling IP addresses from the VMware DHCP Server. What can the VMware Virtual Network Editor do? When you install VMware Workstation, you can install the VMware Virtual Network Editor by default. 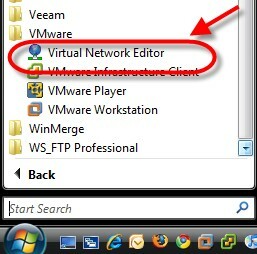 It can be run directly from the Windows Start menu by going to All Programs, then VMware, then Virtual Network Editor. You can also run the Virtual Network Editor inside the VMware Workstation interface by going to Edit and selecting Virtual Network Editor. Summary. The Summary tab provides an overview of all virtual networks (shown in Figure 1 above). Automatic Bridging. 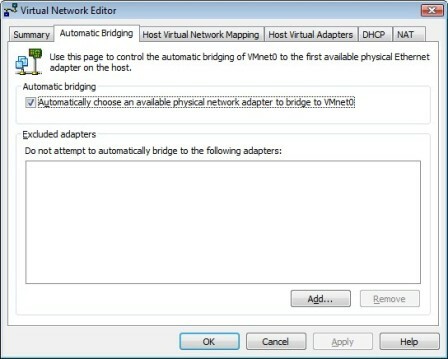 If the host has more than one physical Ethernet adapter, Automatic Bridging controls which adapter the virtual bridge is connected to. Host Virtual Network Mapping. This tab can fully customize VMware Workstation's virtual networks. The default virtual networks can be totally removed and remapped using this tab. Host Virtual Network Adapter. 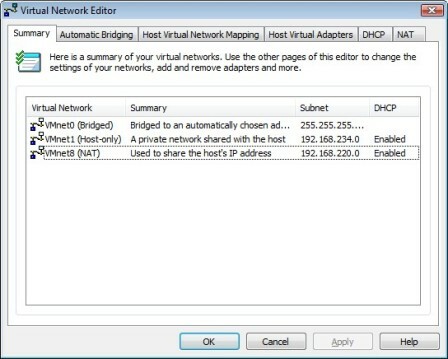 By default two virtual network adapters are created on the host: one for the bridge network and one for the network address translation (NAT) network. 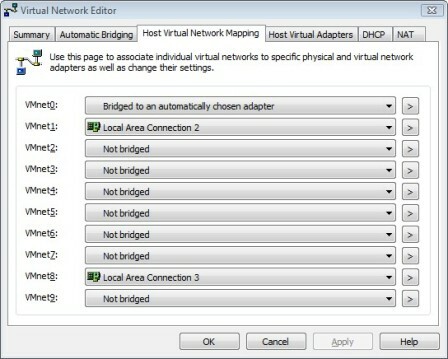 With the host virtual network adapter tab, you can create new virtual adapters or enable and disable existing adapters. DHCP. 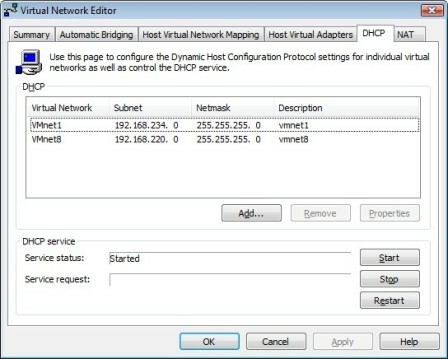 While the VMware virtual DHCP server is controlled for the host-only and bridged virtual networks. In this tab, you can create new DHCP scopes for any new virtual networks that you create. NAT. The NAT tab controls the NAT service, which translates the virtual NAT network IP addresses to the physical network IP addresses. 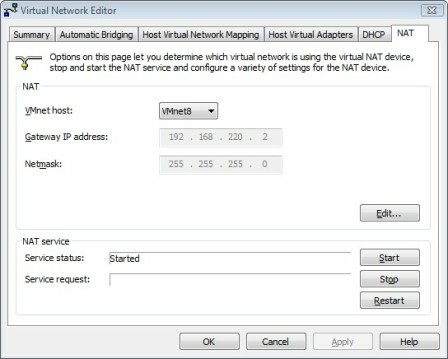 In this tab, you can start/stop the NAT service and designate the virtual network as the NAT virtual network. Additionally, there are several advanced settings available in the Edit section for the NAT virtual network. You can use the Host Virtual Network Mapping tab to create new virtual networks or modify existing ones. If you use VMware Workstation on a computer that has been configured for virtual networking, don't assume that vmnet0 is the bridged network. Vmnet1 is host-only, and vmnet8 is the NAT network. All these things can be changed. If you do connect a VM guest to a new network (such as VMnet4), ensure that VMnet4 is configured in the host virtual network mapping tab or else that VM guest will be connected to nothing at all. The Host Virtual Network Adapters are required to connect host-only or NAT networks to the host or the local LAN. All VM guests on a host-only network can communicate with one another and with the host. If you want to create a private network between guests (without the host), create a new VMnet not connected to a virtual adapter. All the VM guests can then communicate with one another but pull IP addresses from the VMware virtual DHCP server (enabled for a new VMnet by default). Alternatively, you can use static IP addressing or y have a VM guest that is a virtual DHCP server. While the Virtual Network Editor's capabilities may have intimidated you in the past, the goal of this overview is to familiarize you with the tool's core functions and benefits. I hope this provides an introduction to Virtual Network Editor and enables you to get started with the tool. ABOUT THE AUTHOR: David Davis (CCIE #9369, VCP, CWNA, MCSE, CISSP, Linux+, CEH) is the director of infrastructure at Train Signal Inc. He has written hundreds of articles and six video training courses, including the Train Signal VMware ESX Server video training series. His websites are Happy Router.com and VMwareVideos.com. Can the perks in Fusion 7 Pro persuade you to upgrade?